We are a UK based supplier of Aluminium Square Bar, supplying both industry and the public with a range of Aluminium Square Bars cut to the exact length required and quickly delivered to your door. Aluminium Square Bar is an extruded product – this gives a good surface finish and nice square edges to the material. All of our Aluminium Square Bars are supplied in Grade 6082T6 – this is an excellent general engineering grade of aluminium. 6082T6 Aluminium Bars are great for turning, milling, CNC machining, drilling and tapping. 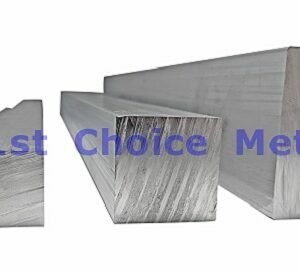 Square Aluminium Bars have excellent weldability – should you require your Aluminium Bars or other aluminium sections welding together, then please contact us with your requirements, and we will get back to you with a quotation to fabricate the items(s) that you require. We can supply you with Aluminium Square Bars as short 10mm long, right through to 3 metres long and any length inbetween. All you need to do is add the required size of Bar to your basket and then follow the instructions on screen to take advantage of our free cut to length service. Orders placed before 1pm on a weekday are usually despatched sameday, and next day delivery is available on all of our products, making us the 1st Choice if you are in a hurry for your metal. Aluminium Square Bars are most commonly used as a raw material for manufacturing components that are supplied to to the Automotive, Rail and machine tool industries. Also, because of its good strength, light weight and anti corrosive properties, Aluminium Square Bar is also often used in construction.